The Queensland Government this week provided an in-principle commitment of $800 million towards building Queensland's number one infrastructure project. Premier Annastacia Palaszczuk said this was the biggest funding commitment to Cross River Rail by any government in its history, and part of the Government’s $40 billion four-year infrastructure program announced in the 2016-17 State Budget. The move comes as Building Queensland, the state's independent infrastructure adviser, declared Cross River Rail ready for state investment in its Infrastructure Priority Pipeline Report. Premier Annastacia Palaszczuk said this was the biggest funding commitment to Cross River Rail by any government in its history, and part of the Government's $40 billion four-year infrastructure program announced in the 2016–17 State Budget. "This builds on our recent commitment of $50 million in the 2016–17 State Budget to establish the Cross River Rail Delivery Authority and commence early work, and $634 million funding to deliver the critical European Train Control System which will pave the way for the project," Ms Palaszczuk said. "With the business case now endorsed by my Cabinet, it will be provided to the Federal Government and Infrastructure Australia to ensure we urgently secure Federal funding. "Cross River Rail is the Queensland Government’s highest priority infrastructure project. A 10.2 kilometre link from Dutton Park to Bowen Hills, with 5.9 kilometres of tunnel under the Brisbane River and CBD, Cross River Rail will connect to both northern and southern rail networks from day one of operations, providing significant benefits to commuters from both directions. This second rail river crossing will ease congestion, improve network reliability and increase accessibility to the Brisbane CBD, allowing more people to travel longer distances, with shorter journey times. Cross River Rail will deliver services to stations at five key locations: Boggo Road, Woolloongabba, Albert Street, Roma Street and Exhibition showgrounds. The new Boggo Road station will improve interchange opportunities for passengers in the south as well as students accessing The University of Queensland. 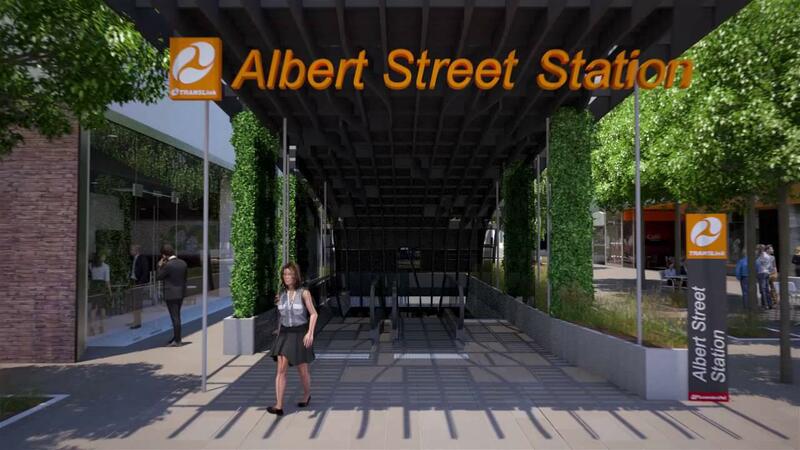 The new Albert Street station will be centrally located, providing easy access to 1 William Street, Queen Street Mall, the Botanic Gardens, Queensland University of Technology and the $3 billion Queen’s Wharf Development. The new Woolloongabba station will improve accessibility to health and entertainment landmarks and provide multi-modal public transport connectivity. Footage shows the network travelling to the new Woolloongabba Station Precinct where its underground tunnels continue under the Brisbane River to the new Albert Street Station precinct, then on to the new Roma Street precinct. The Cross River Rail tunnel portal opens near Victoria Park, through to a new Exhibition station precinct, which then connects to existing Caboolture and Sunshine Coast services.